We almost didn’t open this bottle… after sampling a quintet of “Dream Drams” in Dubai early 2019, we stopped to enjoy a delicious dinner, socialize with our better halves until someone somehow came to the conclusion that we simply had to open just one more bottle! 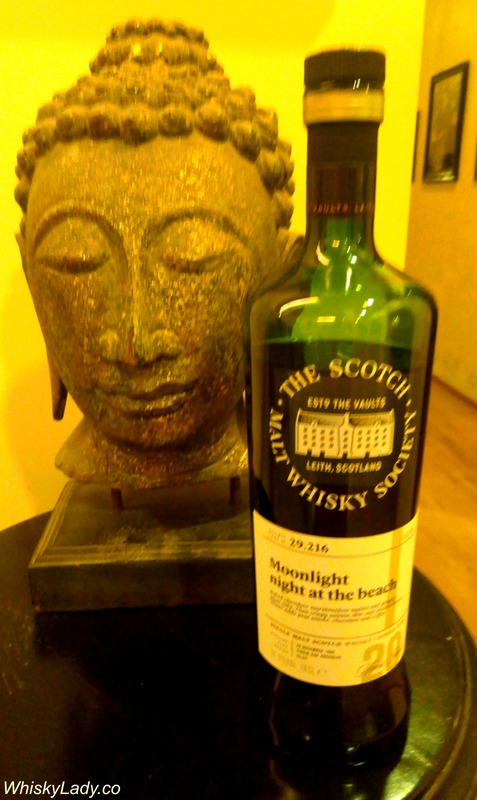 So out came this Laphroaig, bottled by the folks over at Scotch Malt Whisky Society (SMWS), fancifully dubbed “Harmonious Balance.” Matured for 19 years in refill ex-bourbon hogshead cask, this whisky truly turned out to be the “show stopper” of the night! 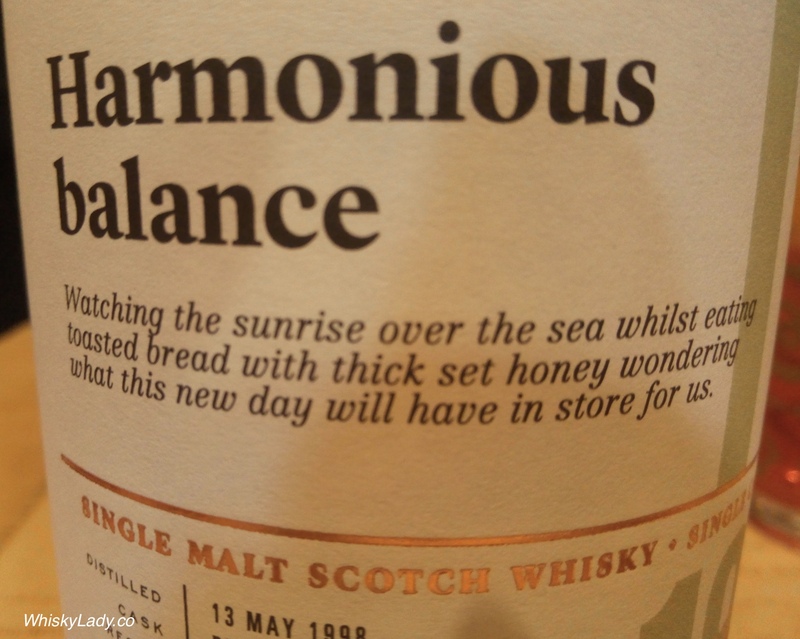 For many, this was the favourite of the evening… even those who purport to not care for peat were won over and we must admit it was aptly named “Harmonious balance” as all the elements came together in the most beautiful way. Imaging waking up, looking out the tent door pitched on the beach and seeing a glorious sunrise over the sea. We then made breakfast on a driftwood campfire by toasting bread and having it with salted butter and thick set honey. To taste, cigar smoke sweetness at the start, ashy with a hint of tar in the mid palate and a slightly herbal/peppermint finish – all in perfect balance and harmony. When we reluctantly added a drop of water the sun continued getting higher in the sky and the scent of fresh salty sea air made us feel ready for whatever the day had in store for us. It was one of only 234 bottles produced from the cask, last seen online selling for approx EUR 200. There is no mistaking either the Laphroaig stamp or the port influence on this one… bringing a rich juicy dimension to the peaty Laphroaig… a rather delicious dimension. Laphroaig’s Brodir single malt Scotch whisky was originally released to the Travel Retail market. You can probably guess what ‘Brodir’ means in ancient Norse – of course, it’s ‘Brother’. For this expression, the Islay distillers first matured the whisky in ex-bourbon barrels before transferring it over to casks which previous held Ruby Port. The combination of Laphroaig’s classic coastal peaty gorgeousness with the elegance of the Ruby Port finish make Brodir a very handsome dram indeed. Nose: Fresh honey drizzled over dried tropical fruit, followed by a salty sea breeze. Palate: Quite refreshing and light (for a Laphroaig). Continued fruitiness on the palate, somewhat juicier than the nose might suggest. Smoke pops up a little later. Finish: Rich smoke on the finish grows and grows. What else did we explore in our Islay Iterations evening? It began innocently enough with our host sharing she had her favourite Lagavulin 16 year tucked away for her session.. followed by another Whisky Lady picking up an Islay independent bottle from an undisclosed distillery… which I just happened to have an open cask strength version of… followed by another Whisky Lady picking another Islay – again undisclosed distillery… Added to the mix was a contrast of a Laphroaig with a port finish that then somehow sparked unearthing another Laphroaig expression. Which translates into an initial plan to try 3 bottles that morphed into a set of 6! 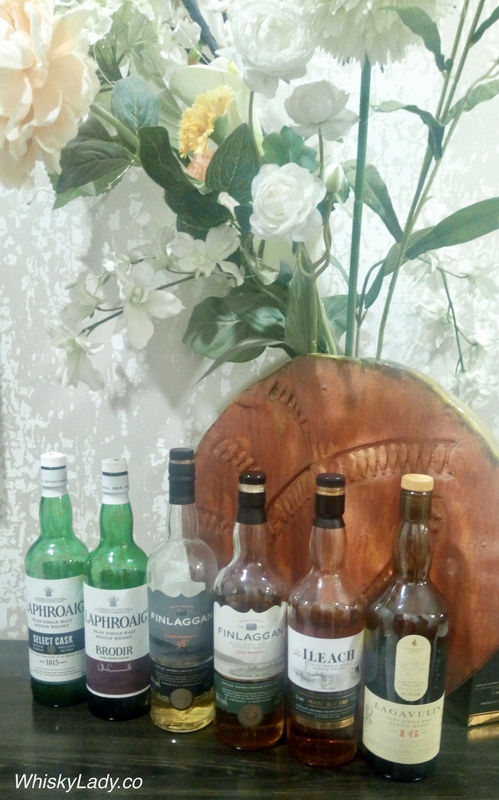 What did we sample in our Islay Iterations? Some ladies continued on with the Laphroaig Select Cask… whereas I must admit my sipping and sampling of the initial set was more than enough for me! Our final dram of our monsoon malt evening was my bottle of Finlaggan Cask Strength 58%, bought to join an undisclosed distilleries session. The story of Vintage Malt Whisky Company‘s Finlaggan is deliberately unclear. 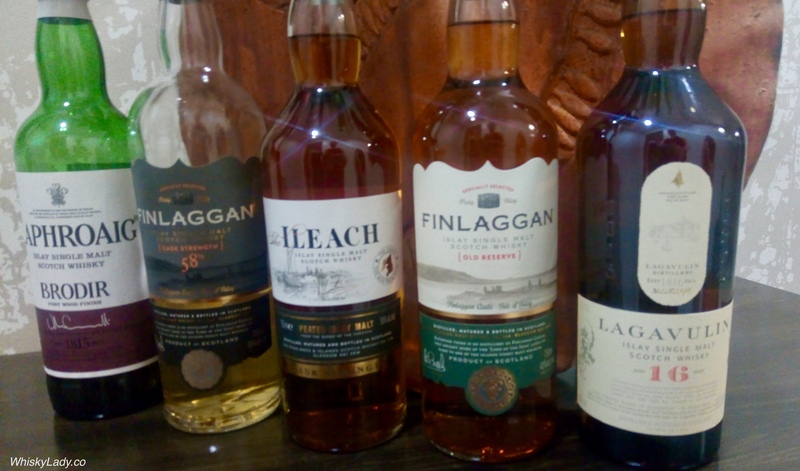 As an independent bottler, Brian Crook‘s team has managed to pull off a feat of balancing quality with price for their brand ‘Finlaggan‘ while shrouding in mystery whether they are from many or a single anonymous distillery. Most speculation favours a single distillery – with names bandied about including Lagavulin, Laphroaig and Caol Ila. The name Finlaggan comes from a loch on the north side of Islay, just west of Port Askaig and the whiskies under this label are intended to “embody the spirit of Islay” with three core NAS expressions: Old Reserve 40%, Eilean Mor 46% and Cask Strength 58%. They also bottle Islay Storm, which strikes me as clearly Kilchoman – an opinion shared by another fan of the distillery. 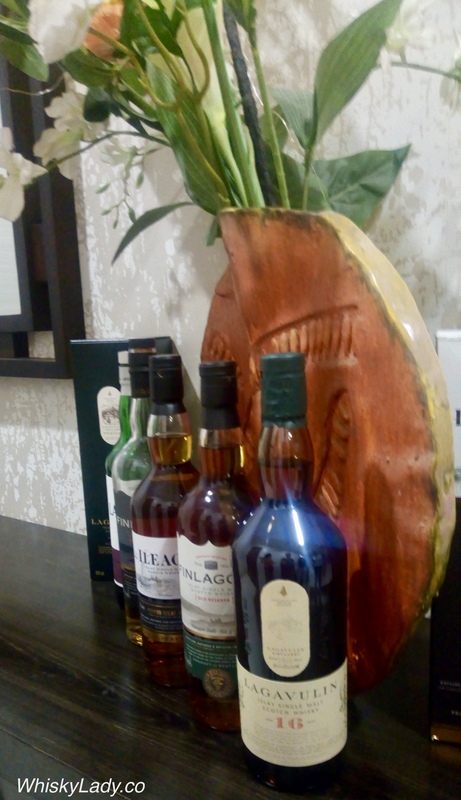 I had the pleasure of sampling the Finlaggan Cask Strength 58% three times with other whisky aficionados and again last night in an impromptu, informal random yet most enjoyable evening at home. While the different tasting notes are all variations on a quite similar theme, together they represent an interesting exploration of an exceptionally affordable, quality dram. It may sounds like a contradiction but it was indeed oddly muted and shy – I couldn’t help but suspect the bottle was open too long with oxidation taking its toll. Our guesses? 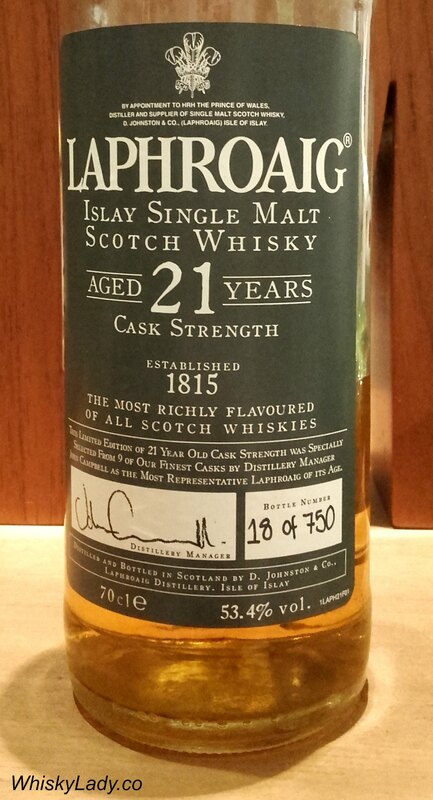 After an initial speculation may perhaps be Caol Ila, Bowmore… settled on Laphroaig. But of an older style. Rolling around on our palate, considering all factors… our guess was Lagavulin. No matter the impression, its a marvellously tasty dram at a most affordable price. Definitely gets full marks for value. Purchased from The Whisky Exchange in London for £48.95 in 2017. 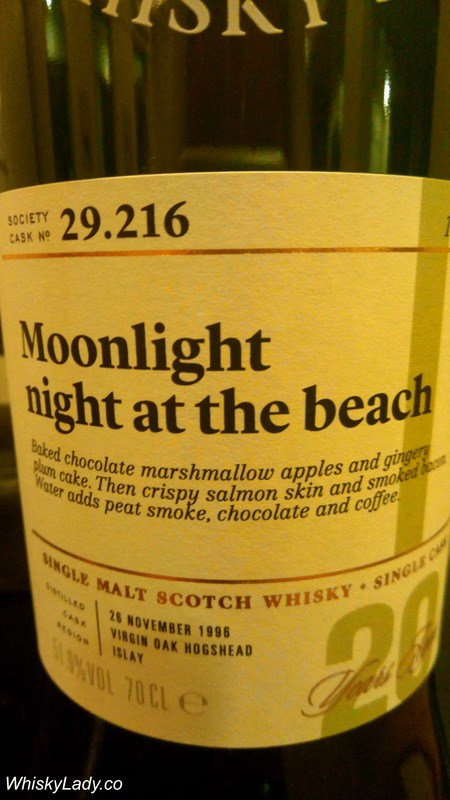 Last in our Bombay Malt & Cigar Scotch Malt Whisky Society evening was “Moonlight night at the beach” where we finally, firmly entered into the land of peat – Islay style! The whisky was wonderfully complex. Peaty but not in an overly forceful way – clearly a mature dram. 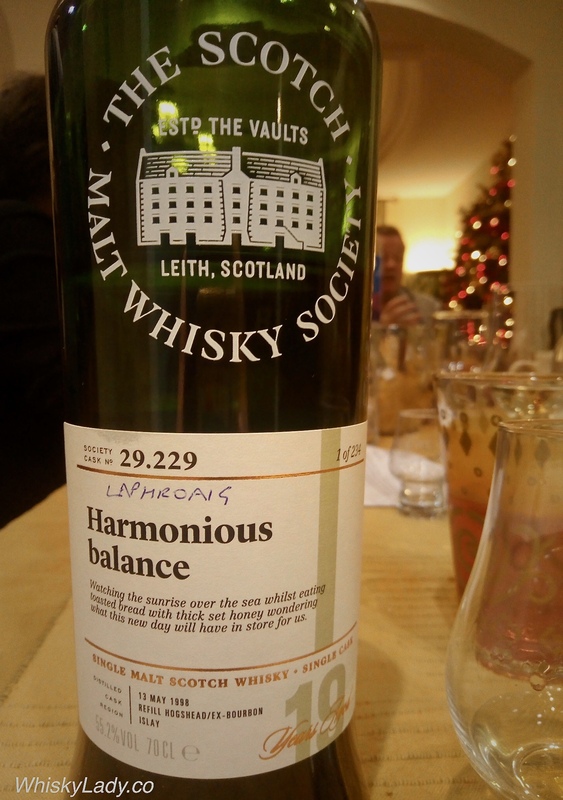 Of all the whiskies we sampled in our SMWS evening, this one was unmistakable – a clear Laphroaig! Not of the current mass market “hit me over the head peat” but a mature, much more nuanced older style Laphroaig. And yes – our guess was spot on. The scent made us all feel very cosy and warm; baked chocolate marshmallow apples, a steaming creamy bowl of porridge and gingery plum cake. To taste, crunchy, chewy and crispy skin salmon crackling at first before sweet flavours arrived in the form of honey cured hickory smoked bacon. With water we made a campfire on the beach out of driftwood under a moonlit sky and ate sugar coated fennel seeds and chocolate covered coffee beans both infused with a gentle sweet peat smoke. Nineteen years in an ex-bourbon hogshead, finished in a virgin oak hogshead with a heavy toast and a medium char. 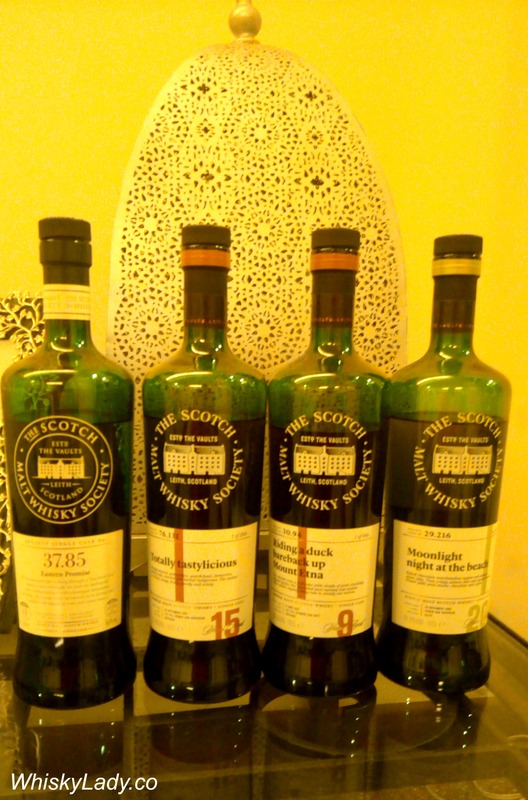 What else did we sample in our SMWS evening? Once upon a time there were Bombay, Delhi and Pune chapters of the Scotch Malt Whisky Society in India. I’ve certainly come across a few bottles in members homes… and rumour has it there remains stock at Indigo too. However to have an opportunity to explore over an evening four single cask strength SMWS bottles with our Bombay Malt & Cigar Club? Bring it on! 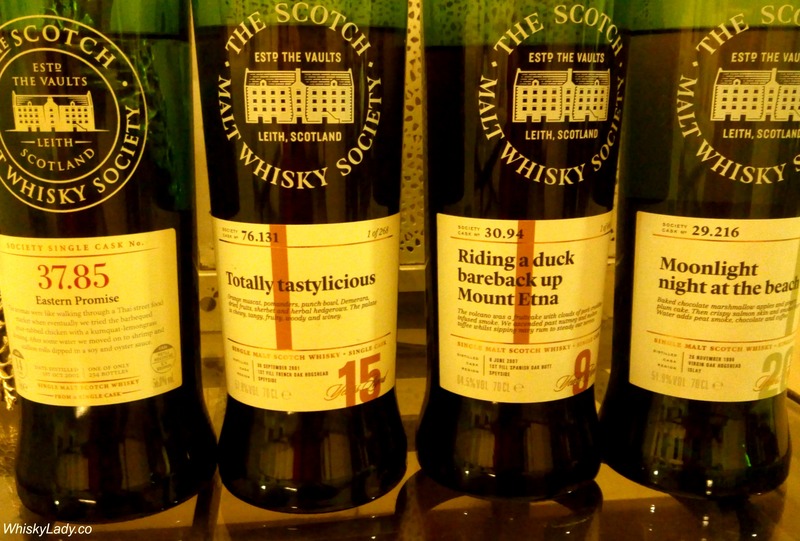 What all did we sample in our SMWS evening? The bottles reveal only the region, cask type, alcohol strength and in some cases the age… however for those clever enough to do a simple online search, all is revealed about the distillery codes. As for what we thought? Tasting notes available by clicking on the links above. I should also note, the sampling order which was spot on in terms of a tasting profile progress from light to sweet to robust and peat! And our cigar of the evening? An Edward Sahakians private vintage selection 1999. A might fine night it was indeed. A few months back I shared a trio of whiskies with our original tasting group – each did not disclose the distillery. 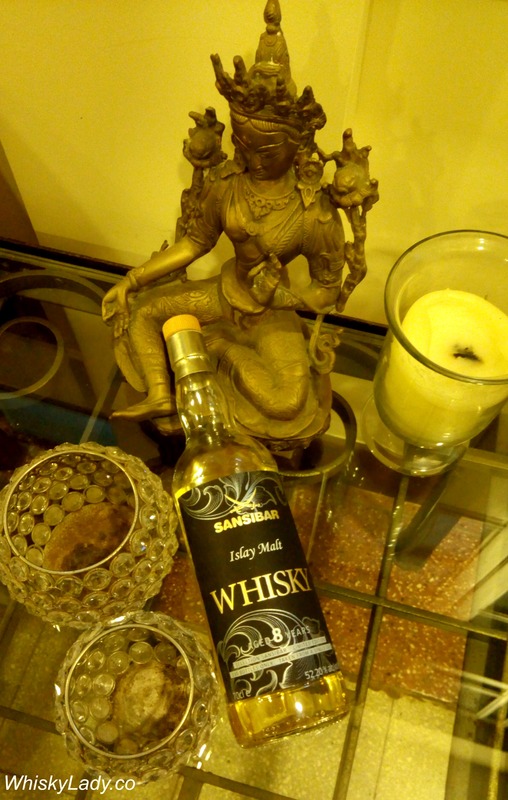 My original intention was to immediately share the same whiskies with our Bombay Malt & Cigar group… we had a wait a few extra months and by the time the evening arrived, I managed to add a 4th undisclosed distillery bottle to the mix – what fun! We found it warm, fruity, luxurious and utterly delicious… there is a rich robustness to this whisky which belies its mere 43%. And the guesses? From Glenrothes, to Glendronach to Aberlour… none suspected Macallan. Water – Had a bit of a debate – yes or no – with a complete divide on whether we preferred with or without water. Some found it made it sharp and sour whereas others thought it tamed it into sweet submission. Interestingly, while the Wilson & Morgan seemed stronger and richer than 43% the Sansibar didn’t give a hint of being cask strength. And the guesses? It was more a process of elimination… everything it was not and only a ‘maybe’ Ardbeg… firmly in the ‘Well it isn’t…’ category was Lagavulin. Oops! It has a simple yet interesting nose, a complex palate, with a sweet finish. And the guessing game? Perhaps Bunnahabain, Bruichladdich… certainly not Caol Ila! Final guesses? After an initial speculation may perhaps be Caol Ila, Bowmore… settled on Laphroaig. Wilson & Morgan “Highland Heart” Sherry (2006/2015) 43% – A class act – beautifully balanced wine, spice – simply superb! Sansibar Islay 8 year (2007/2015) 52.2% – Citrus spice & everything nice! 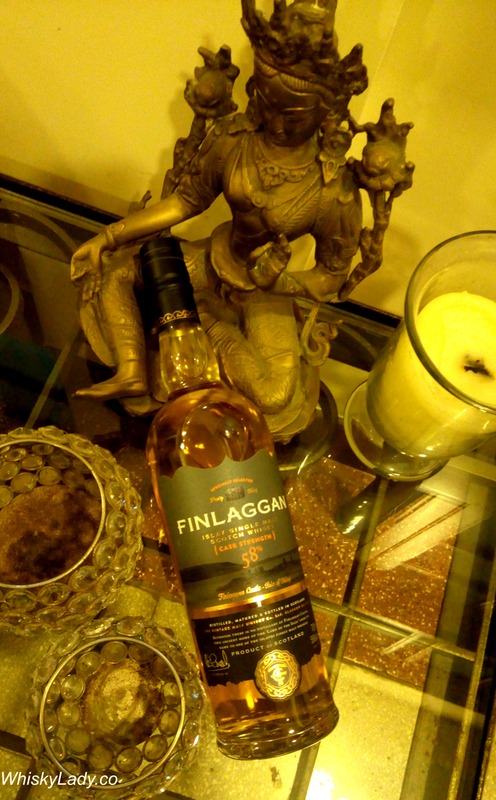 Finlaggan Cask Strength 58% – Leather, flowers, oh my! Having an opportunity to ‘try something different‘ seems to be the hallmark of most whisky aficionados journey. 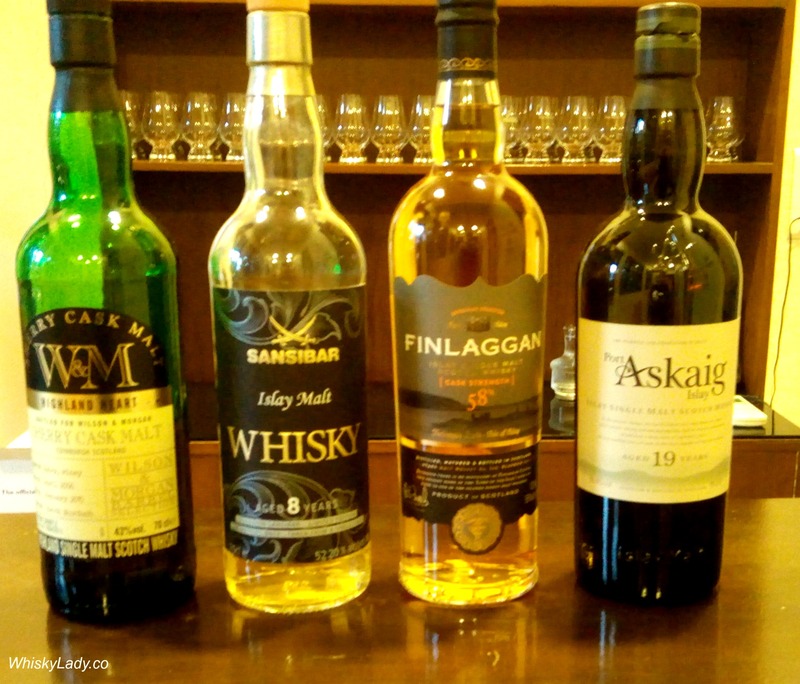 What better way than through bottlers not disclosing the distillery… here follows the tasting notes and speculation from an anonymous Islay whisky flight experienced at The Single Cask in Singapore. Finish – Bitter… makes you want water! Cask Islay is a small batch release from A.D. Rattray and you can read what they have to say here. The folks behind this bottle is The Vantage Malt Whisky Company and you can read what they have to say about Islay Storm here. IanMacLeod Distillers created the Dun Bheagan collection to feature a range of single casks. It may sounds like a contradiction but it was oddly muted and shy – can’t help but suspect the bottle was open too long with oxidation taking its toll. Again, the folks behind this marvellous dram are The Vantage Malt Whisky Company, with more details about their Finlaggan range available here. All were interesting. All would be quite affordable in the UK and not pocket destroying in Singapore. I kept coming back to the Islay Storm, whereas my companion was particularly partial to the Finlaggan. If anyone can prove or disprove any of our speculations – would love to hear! 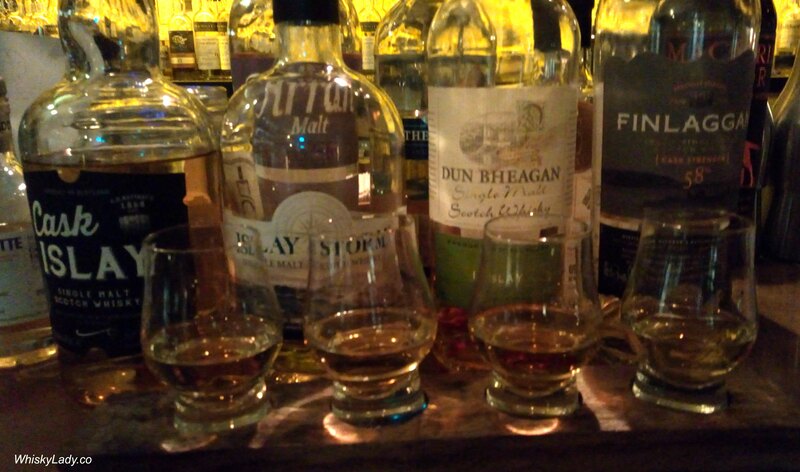 So there we have it… a wee whisky flight and a most enjoyable evening in Singapore. 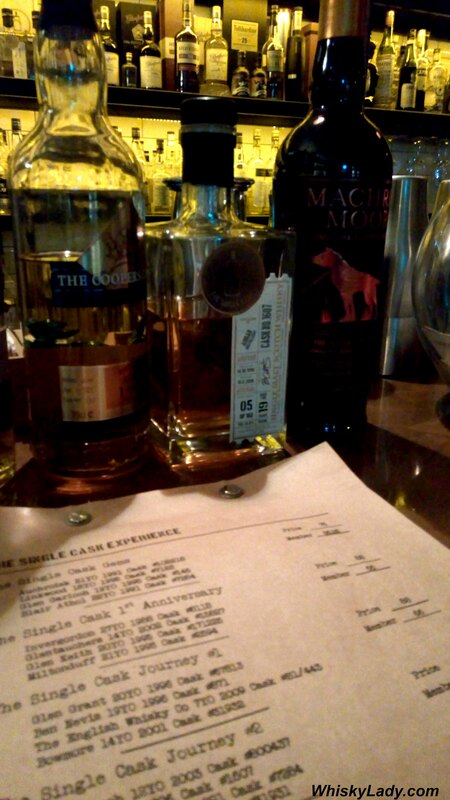 The Single Cask is located at 01-25 Chijmes Caldwell House, 30 Victoria Street, Singapore 187996 / info@thesinglecask.sg / +65 6837 0953. 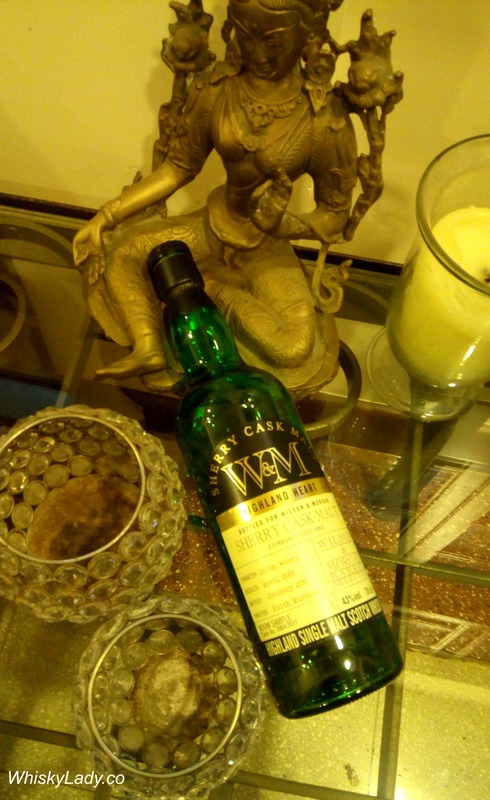 My first Bombay Malt & Cigar evening closed with this whisky… by that point note taking was not happening, instead it was pure unadulterated enjoyment of a cigar with an exceedingly fine dram. So what a treat to revisit this whisky to close our September miniatures evening! Water – Much preferred this beauty neat! 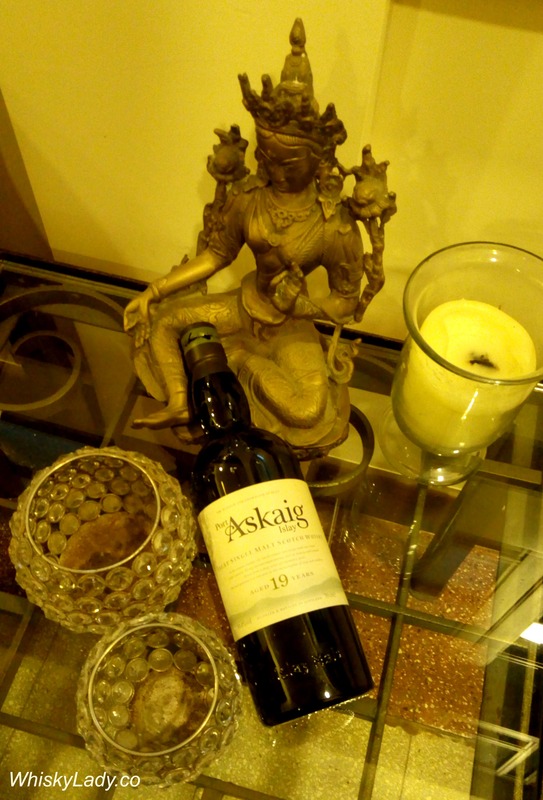 Overall this whisky was in a different league… an absolute stunner! I did a bit more digging to discover this particular bottle last sold for approx $2,250. It had two editions – 750 bottles for the UK and 1427 for the US travel retail market. It was also known as the “T5” Laphroaig as it was created by distillery manager John Campbell to commemorate the opening of Terminal 5 (T5) at Heathrow Airport, London in 2008. While further details were not disclosed, it was said to be a ‘marriage’ of 9 casks. The owner indeed picked this bottle up at the newly opened T5 Heathrow Airport… Back in 2008, he was in the height of his peaty loving phase, so acquiring a special edition Laphroaig wasn’t a difficult decision. What was more remarkable was hanging on to it for almost 8 years, carefully kept aside. And for this kind and considerate act, we were ever so grateful! It used to be when you thought ‘peat’ you thought of Islay and likely the mighty Laphroaig…. its thick, tar and rubber quality with seaweed, iodine which stands up to say ‘Hello Islay peat!’ This quality puts it firmly on the favoured ‘hit list’ of true die hard peat lovers. Whisky lovers will also often share their whisky preference arch… often starting with easy drinkable blends, then graduating to ‘gateway’ commercial single malts and then somewhere along the way while exploring various single malts getting their mind and taste buds absolutely blown away by something completely peaty! Some remain in their ‘peat phase’ for a long time… others evolve beyond that while still harbouring a special place in their whisky heart for the first peat punch that hit their palate. After an early flirtation with Laphroaig, I moved on to others quite quickly. 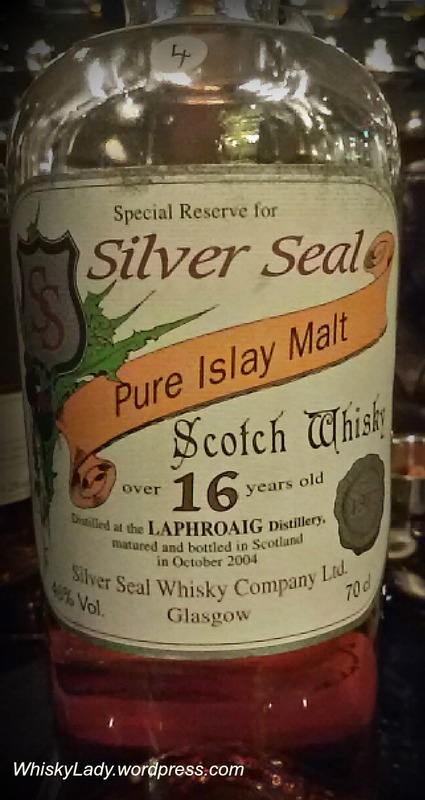 However I will never forget the ‘silver seal’ Laphroaig 16 (1987) that I sampled… it was distinctly different than what I’d come to expect with a soft, sweet, almost flowery quality with initially just a curl of smoke before revealing its peatiier nature. So when I saw several newer Laphroaig’s were playing around with different elements was quite excited! Smartly, took advantage of samples available at the Singapore duty free which were promoting their new PX Cask thinking it may reveal some of that sweeter, lighter and almost teasing quality I found with the 1987. They were also freely offering the An Cuan Mor meaning ‘Big Ocean’ for its proximity to the ocean. Short answer is I passed on the Laphroaigs and surprisingly (to me!) acquired without a pre-tasting a boxed set exploring the underlying single malt elements in Ballantine’s 17 year. The challenge with those split second airport decisions is you know you are not truly giving the whisky a proper chance so I was delighted the PX made a re-appearance in a recent tasting session. Water – Are you kidding? Nooooo! That was when I realized how spoilt we’ve become in recent years with cask strength whiskies… And if not cask strength, then tending towards higher strength rather than the standard entry level whisky at 40%. Far from the ‘in your face’ peat I remembered, the 10 year seemed a tad weak though clearly peated. When sampled next to the PX, suddenly discovered in the PX that I had earlier missed… by contrast it has a much sweeter quality and could clearly discern the sherry stamp. 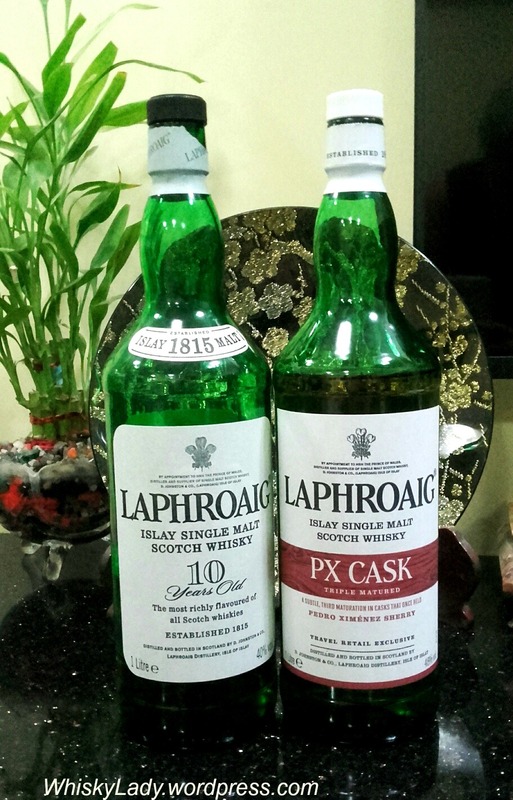 And what do the folks over at Laphroaig have to say about their PX? NOSE: From the bottle there is a nice sherry aroma of sweet sultanas and raisins with a hint of sweet liquorice and only the slightest tang of peat. Adding a little water brings out the marzipan and almond aroma with a counterpoint of creamy nuts and lots of ripe fruits but again there’s only the slightest tang of peat smoke. PALATE: Without water a massive explosion of peat fills the mouth with huge amounts of oakiness only just moderated by the sweeter heavy sherry flavour. Adding a touch of water only slightly moderates the massive peat reek which very slowly fades and just allows a little of the sweeter sherried flavours to come through although there is always that burst of peat smoke that dries the mouth.